Hopefully you’ve all enjoyed seeing our fresh studio makeover. One of my favorite parts of this rejuvenating redesign is the black & white art on canvas in our dining room. It is particularly special because Ulysses and I spent a romantic day together at a park, somehow sharing one camera between us, with the specific goal of photographing for our dining room decor. We wanted to make it an even more special place to gather with family and friends. We wanted something naturally artful, unique, warm, and yet dramatic. 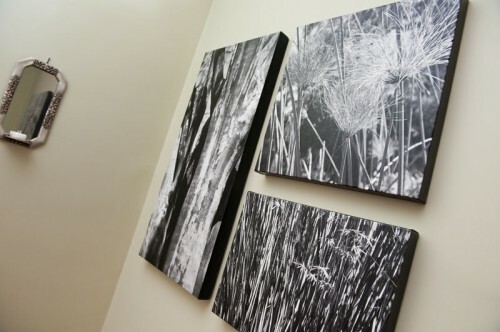 We also knew these photos had to be displayed on museum-like canvas, and our fabulous canvas maker helped us see our vision through with perfect canvas wrap mountings with thick black borders. We couldn’t be more thrilled with how it all turned out. Ulysses and I are so excited to announce that we are now making this artwork collection available for purchase on our site! It is available only on our thick canvas wrap, in black & white or brown tone. You can find the gallery at our main website under “Client Proofs”, or you can also access it here. If you need help with your selections, we are available for design consultation. Just send us a photo of your room with measurements, and we’ll send you our custom recommendations on sizes and display styles. And to assist further, we’re offering a great introductory special for the next 4 days only: 20% off any piece in the Artful Moods on Canvas gallery! So hurry over now and check out the gallery.